"Not so much a lipstick as a lip treat, this rich, lasting lipstick contains 16% natural mineral colour blended with 77% organic ingredients to moisturise, nourish and protect while adding stunning colour. Ingredients include our omega 3:6:9 essential fatty acid-rich Organic Beauty Oil, antioxidant white tea, skin-nourishing organic argan oil, pomegranate oil and shea butter, with conditioning organic beeswax and our signature tasty organic sweet orange oil for lasting colour that cares." 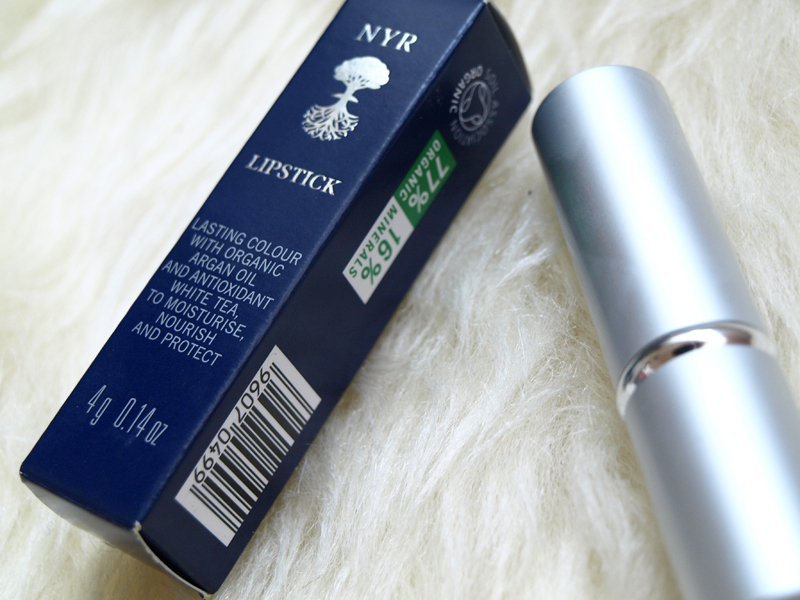 I adore organic skincare and makeup and I had a chance to try some NYR products before, but this lipstick is the newest organic addition to my makeup bag. 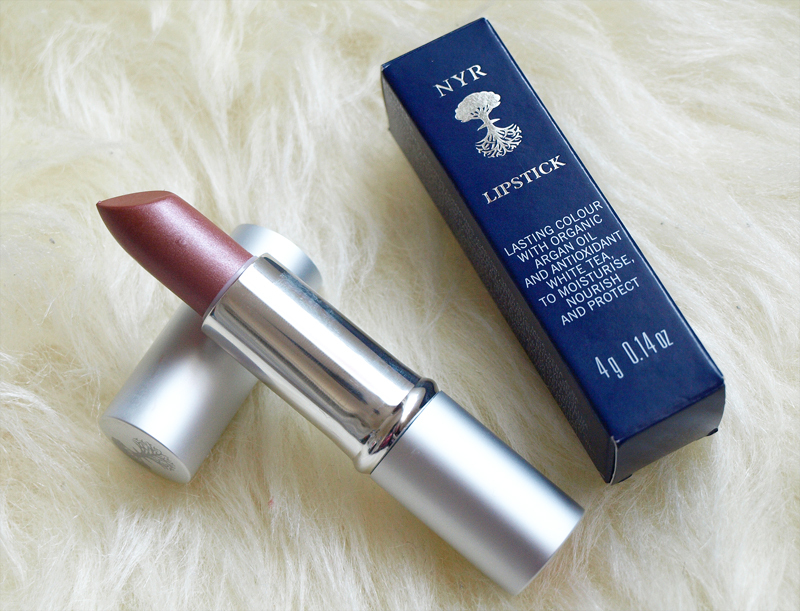 Lynn - one of my advertisers is an independent NYR consultant and she kindly sent me this gorgeous lippie to try out. First of all, the sliver packaging is sleek and elegant and I really like it. 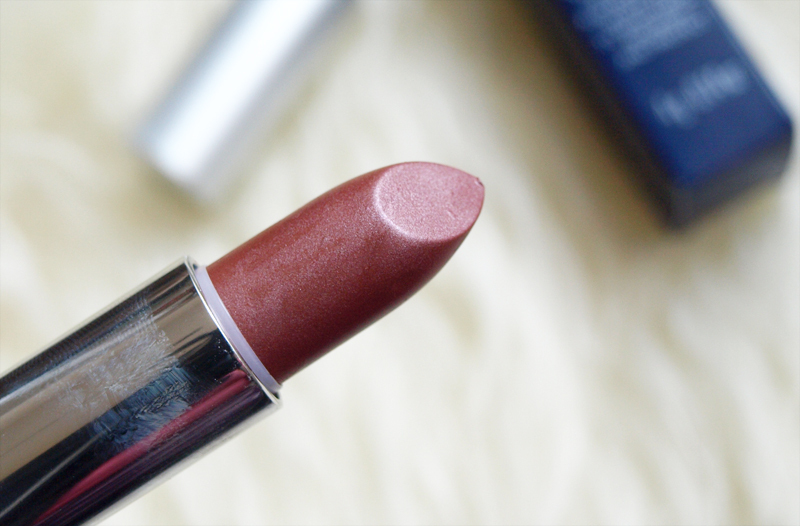 The lipstick itself is packed with goodness and is a treat for the lips! It is made with organic oils, bees wax, shea butter and white tea. The formula is very moisturising and long lasting and the colour has a very unusual finish. To be honest, I am finding it really hard to describe the shade of this lipstick. I would say that it is a brownish pink with a frost finish. It is very unusual and I don't have a similar lipstick in my collection. I really like the frosty shimmer and the way it reflects light. Most importantly, the formula feels very comfortable on my lips, it is nourishing and smells lovely and tropical. The lipstick contains organic sweet orange oil and tastes slightly sweet - always a bonus. I was pleasantly surprised with the lasting power - it stays put for 4-5 hours and fades evenly. 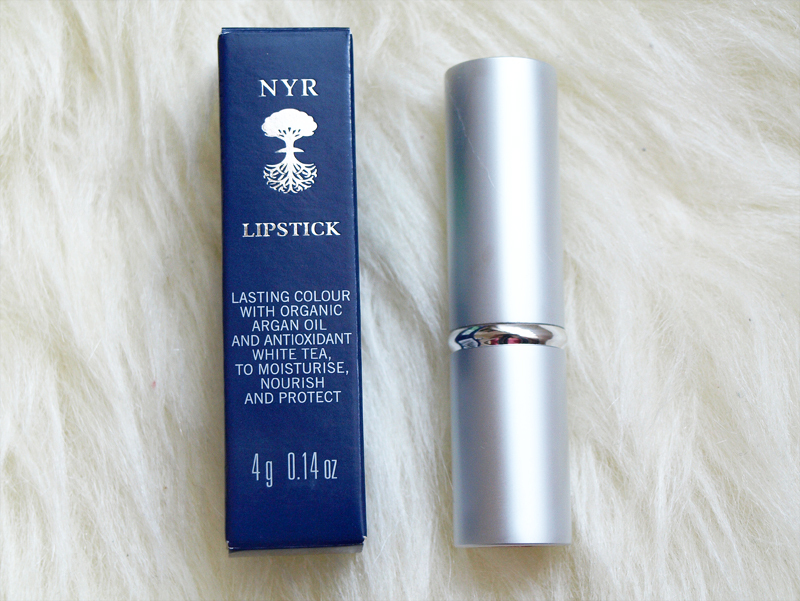 Overall, I really like my first NYR lippie and I would definitely recommend it, especially to anybody who loves organic makeup. PS. I included swatches on my arm and lips in daylight, bright light and with flash, to show you this gorgeous colour. How would you describe it?